The Competency-Based Management Blog: What is Competency-based Career Planning & Development? Competency-based Career Development is a planned system to link individual career needs with the organization’s workforce requirements. From the employee perspective, they are looking for career opportunities that address their strengths, support development, provide challenges and match personal interests, values and preferred working styles. The organization on the other hand is looking to have employees develop themselves in a way the addresses the organizational needs. Therefore, putting career development tools and processes in place to highlight the options and career paths available to employees is in both the organization’s as well as the employee’s best interests. Collaborative learning, knowledge sharing, communities of practice – e.g., through social networking tools, wikis, etc. 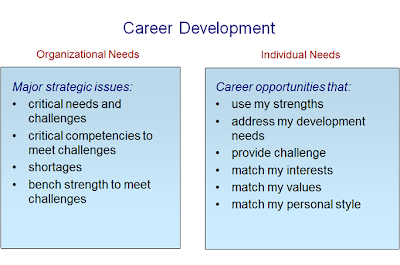 Career Development traditionally has been driven primarily by employees. Organizations provide the frameworks, tools and processes, but the responsibility rests with employees to take advantage of these to advance in their careers. Succession Management, on the other hand, has traditionally been management driven. Key roles are identified1, and ranked lists of suitable candidates are prepared based on their existing competencies and / or potential to perform in the targeted roles or levels. Potential to perform can be identified in a number of ways: past performance in career track positions; supervisory assessments of potential; standardized assessment programs (e.g., assessment centres); etc. The lists are used to appoint candidates as positions become available. More recently, however, the lines between the traditional concepts of Career Development and Succession Planning have blurred. Organizations are instituting programs that allow employees to progress through a phased program of development aimed at increasing employee competencies and preparing them to take on increased responsibility. These programs typically include: formalized in-class training; planned work assignments; assessments at key stages; and, “gradation” defined through some form of assessment or certification, and / or appointment to targeted roles or levels. Technology has significantly improved the ability of organizations to address both employee needs for development, while ensuring developmental activities align with organizational goals. Tools like CompetencyCoreTM 5 make it possible to implement blended stream-lined approaches that support all stakeholder needs. This eliminates duplication of effort and ensures information on employees’ competencies are leveraged to achieve both personal and organization goals. 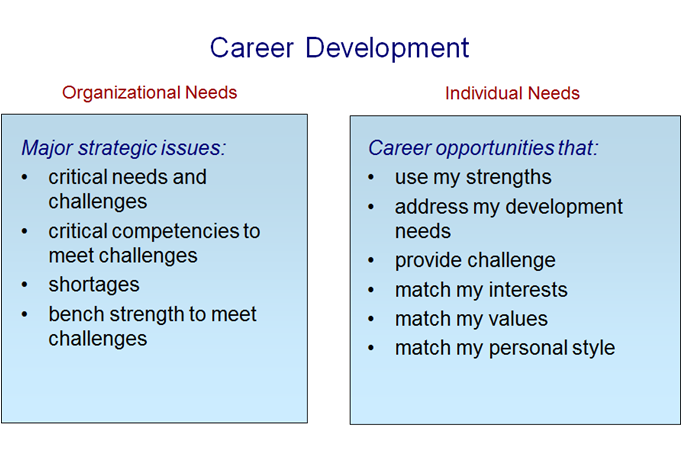 The subsequent blogs provide a more detailed look how competencies enhance the Career Planning and Development. 1 Those positions that are important to the success of the organization and cannot remain unfilled for long. The next blog in this series reviews some key definitions and foundational elements of Competency-based Career Planning & Development. Sign up to our blog’s mailing list through the form on the right-hand side to receive the rest of the series in your inbox.